Marie says "After an illness in our family, we decided to strip life back to the bare minimum to see what was left. What we found was a value for family life, time generously shared with family and friends, laughter to fill our small cottage...Happiness at the hearth! We strongly believe in building social capital and that this is a true measure of wealth. We are raising our three young children to be resilient in an increasingly changing world. I have a keen interest in economics and sociology with a background in accounting". 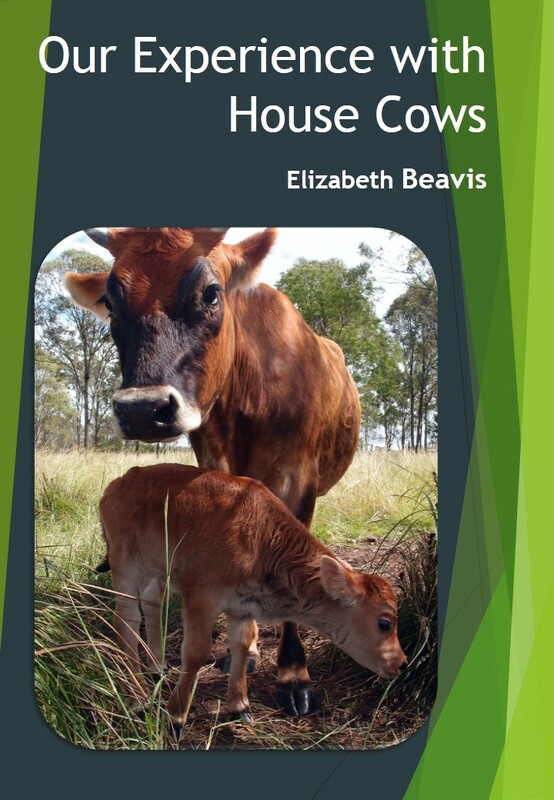 Marie has also very kindly written the hand-milking section of my house cow ebook (coming soon!). 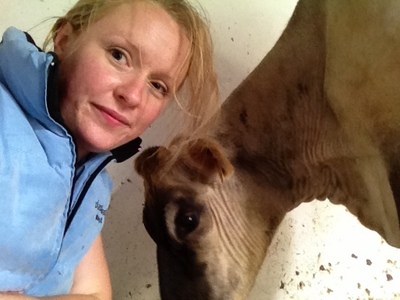 Farmer Liz: Tell us about how you came to own a milking goat and a cow. Marie: I grew up on a small mixed farm that included a dozen dairy cows that my dad milked for the creamery. He got out of milking in the early nineties due to changes in the milk quota system. My husband and I considered purchasing a milking animal five years ago, during this time our son as an infant was having great difficultly due to milk allergies. 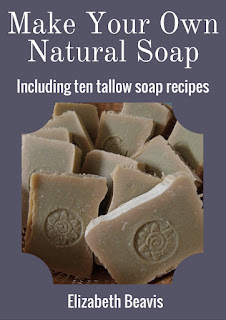 Shortly afterwards my husband was diagnosed with cancer. This caused us to become concerned with our family's diet and nutrition. 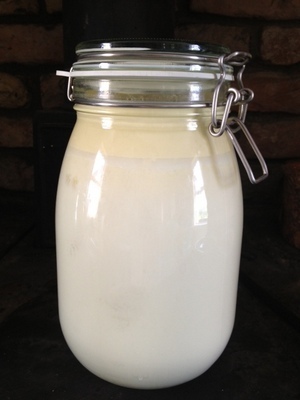 We began purchasing goat milk for our son and immediately his condition improved. The supply of the goat milk was irregular and it was very expensive. So we decided to purchase two milking goats. That was five years ago and since then we have learnt a great deal. We sold the goats two years ago and have been milking a cow for about three years now. We changed from goats to cows for several reasons. We had planted an orchard and a vegetable garden that they regularly destroyed. It was very difficult to fence or tether them. While the children enjoyed the goats milk, myself and my husband did not enjoy the taste. I wanted to be able to have cream to use in the kitchen. Kid goats are problematic to find a home for. We have our current cow one year. She is a Dutch jersey called MamaMoo. She is an older cow at 11 yrs and was sold as a cull cow. She is our third jersey and she came from a 250 sized jersey herd a few hours away from us. She is the second cow we purchased from this farm. The previous cow we give to family to milk when we moved house. She is still with them and much loved. M: I have always hand milked the goats and the cows. We have a bucket machine milker so that hubby can be the relief milker for me. I have only used the machine a few times but it makes a lot of noise and fumes which can upset the cow. I do not find it quicker or easier than hand milking when you consider the effort and time needed to clean the machine afterwards. M: Our routine at the moment is once a day in the evening. The cow is in her second year of lactation and drying off. MamaMoo comes to the gate when I am doing the evening jobs of feeding the pigs and chickens. When I open the gate, she walks into the yard and on into the milking shed. I put feed in her bucket and she stands still for milking without being tied. Once I am finished, she walks herself back to the field and I close the gate afterwards. It is very simple and easy. I usually have children with me helping. 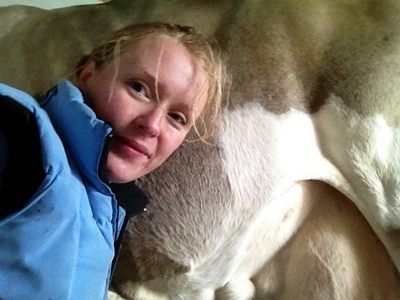 I would usually milk twice a day earlier in the lactation unless we sharemilk with a calf. During the winter, she is keep in a concrete yard next to the milking shed. I have share milked with two cows and one goat and I am now convinced that I will not try it again. It upsets the animals to be milked when nursing you g and they always hold up the milk and are generally unpleasant. In the future I will separate earlier and train any calves to a bucket. FL: Do you use a bull or AI to get your goat back in kid? M: We use AI here and never bulls. We only have one cow and to make a cup of tea for the AI man is less hassle than any bull. FL: How much pasture land do you have for your cow and how much supplement feed does she need? M: We have one acre of pasture divided up into three paddocks. We also have the use of ten acres next to us thanks to wonderful neighbours. We produce about two thirds of the grazing for the cow. We have wonderful rich and fertile soil and a jersey cow has a gentle appetite. Her additional feeding depends on milk production. She gets fed during milking and for the duration of milking. That can vary from 8kgs a day at peak to 1.5kgs a day currently. She usually gets a mixture of high protein dairy nuts and rolled oats. M: I have come to realise that there is no such thing as excess milk. It feeds the pigs, calf, chickens, cats and dogs after we have taken our generous share for the kitchen. I turn it into yogurt, cheese and ice cream. We use about 5 litres a day of milk and cream for drinking and cooking with also. FL: What do you enjoy most about having your own milking goat? M: I enjoy going out in the evening with my bucket to milk the cow. It is a peaceful timeout for me. An escape from the busy day. I sit down into the cow and reflect or sing while listening to the sound of the milk jets hitting the side of the stainless steal bucket. All the while, watching the bucket fill and listening to the pigs squeal as they hear 'their' milk fill too. The dogs and cat sit in close to us, hoping that this bucket is theirs also. The milk is in great demand. FL: What is currently you biggest milking goat challenge? M: Our biggest challenge is our need to replace our current cow. She is empty and quickly drying up. She will need to be sent to the factory and a replace bought. She is such a sweet cow, it will be hard to replace her. FL: What is your advice to those considering getting a milking goat? M: Any milking animals take a large commitment. But they do ensure health. Health of your family, animals and soil. FL: Wonderful information Marie, thanks so much for sharing this. One thing that I found interesting was your trouble with cows holding up the milk when they have a calf with them. We found that Molly is very passive and will give us all her milk, but Bella likes to keep some for her calf. We came to a compromise where we only milk three quarters and then she doesn't mind giving us all the milk from those quarters and keeping the other one for her calf. This seems to be a good compromise and we don't have to bottle feed a calf. Everyone seems to do this differently and it just depends on finding a balance that works for both the family and the cow. If you have any questions for Marie, please head over to her blog and join in the discussion.